Tours de Sport's Blog: Northeast Ski Resorts - There is More Going On Then Just Skiing! Northeast Ski Resorts - There is More Going On Then Just Skiing! The kids want to go skiing and you hate the cold? Fear not! 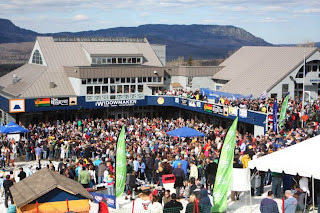 Ski resorts all over the Northeast offer great events to keep even the sun lovers happy! At Seven Springs Resort, PA you can book your vacation during their annual Winterfest celebration. The mountain is alive with yes skiing and snowboard racing as well as arts, crafts and evening kid’s events. For the “Foodie” in you, enjoy the January Gourmet Getaway. A weekend of culinary demonstrations, wine sampling, cooking courses and more! Just sit back, enjoy the view and keep your toes warm by the fire while dining on fabulous cuisine! Love music? Head on up to Sugarloaf, ME for their annual Reggae festival! Soak in the sun Après ski style while jamming to “Da beat” and enjoying cold beer and fresh BBQ. Consider yourself a Deadhead? Take a ride up to Killington, VT for their Sunshine Daydream festival. The event will feature live music from Grateful Dead tribute bands as well as drum circles, dead-inspired crafts and tie-die shirts. Get your Garcia on! With so many events happening all winter long you are sure to find the perfect getaway to suit your style! So let the kids skim the pond or ride the rails while you indulge your other senses! Hey, it’s your vacation too!